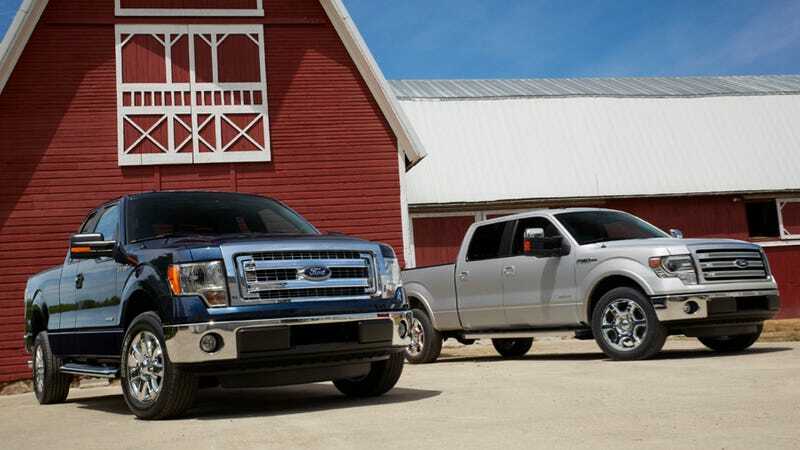 Ford introduced the 2013 Ford F-150 today, and aside from a slight change to the grille, it looks a lot like last year's model. But take heart, Blue Oval engineers — truck buyers are statistically more likely to buy your truck than anyone else's, so in Ford's case, status quo seems to be sexier than planned obsolescence. In fact, the only thing that's new for this year (other than another trim level) is Ford's SYNC voice-activated communications and entertainment system, standard on XLT and above. Lariate, King Ranch, Platinum and Limited models add MyFord Touch to SYNC, which links more of the truck's functions to voice activation and replaces the puny 4.2-inch LCD display screen included in the standard SYNC package with an 8-inch display, mounted in the middle of the dash. Engine options are the same as last year. F150 customers can opt for the 3.5-liter, 365 hp EcoBoost V6, the slightly more eco-friendly 3.7-liter, 302 hp Ti-VCT V6 (Ford said it gets 17 mph city/23 mpg highway compared to the EcoBoost's 16/22), a 360 hp DOHC 5 liter V8 (15 city/21 highway), or a less economical (13 city/18 highway) but beefier 411 hp 6.2-liter V8. Ford's 2013 F-150 release coincided with the company's 65th anniversary of cooperation with the Future Farmers of America, a youth organization dedicated to agricultural education. If nothing else, the connection makes the F-150 seem more farmey. But if that doesn't do it for you, they're offering three new colors and optional HID headlights.